You may require a partial denture to replace gaps in your teeth or a full denture to replace all of your original teeth. If you have missing teeth, your dentist will discuss all the options in detail with you. A full denture has a complete set of acrylic teeth fixed onto a plastic or acrylic base. A partial denture consists of a plastic or metal plate onto which are fixed false teeth that match the shape and colour of your existing teeth. This plate attaches securely onto your existing teeth with metal clips, but it is easily removed for cleaning. 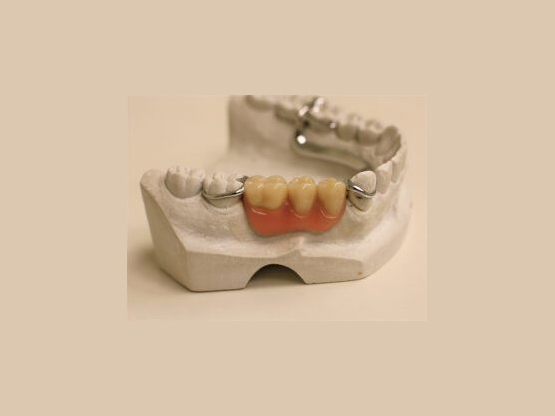 The most common full dentures fit securely over your gums, however, there is a range of dentures available, including some that fix onto dental implants. If your dentist recommends a denture, he or she will take an impression and some measurements of your mouth so that a technician can craft your dentures to exactly fit. If you decide to have dental implants, you may be referred to a dentist trained in implantology or prosthodontics to place these into your jaw. The special denture that attaches to these implants is made of porcelain and has the appearance and feel of real teeth. This treatment is currently unavailable on the NHS.